Each person’s walk through the loss of eyesight is different. 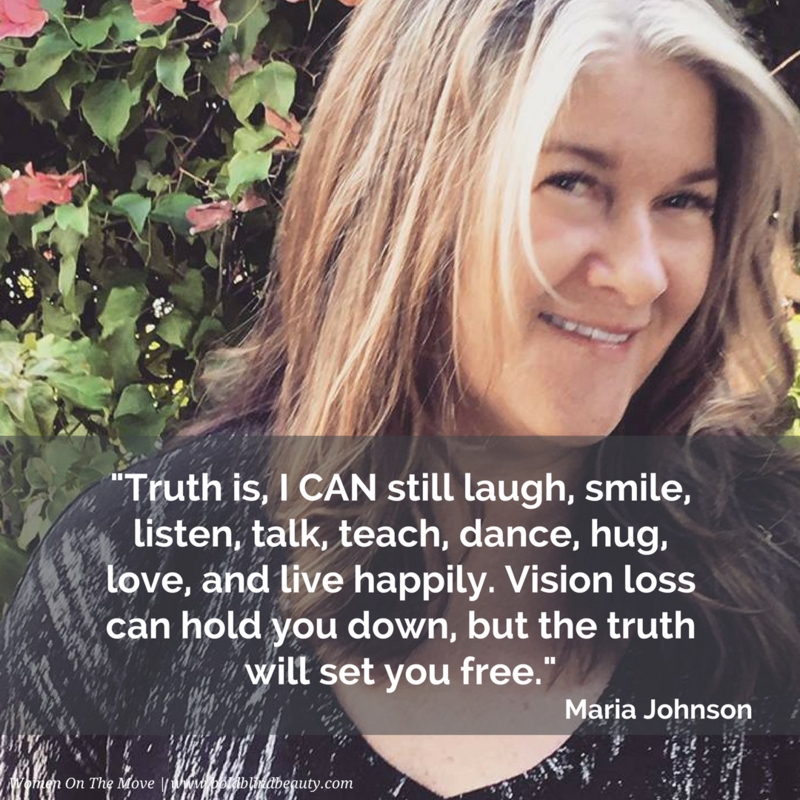 Today’s Woman On The Move, Maria Johnson, of Girl Gone Blind, is a powerhouse. And you get to personally meet by way of her podcast interview with Thomas Reid of Reid My Mind Radio. I recently spoke with Maria by phone and was immediately taken with her energy and how much we share in common. We are in the same age bracket, are parents, and we are passionate about our missions. Maria suddenly lost her eyesight to Leber’s Hereditary Optic Neuropathy (LHON), a condition that can cause the optic nerve to atrophy. As a result, she began to publicly share her journey three months after sight loss. Three and a half years later she’s attained a huge following and is featured weekly on RNIB Connect Radio. When you have a moment take a listen to the podcast and visit Maria over at Girl Gone Blind. Photo of Woman On The Move, Maria Johnson, is of her smiling while showing off her “good hair day.” She is wearing a black and white v-neck top. The photo is in boldblindbeauty.com’s WOTM template. The entire template contains the photo and a transparent gray overlay near the bottom. Within the overlay is the opening quote in the post. So glad you shared! I enjoyed listening to the podcast and subscribed to Maria’s blog.